Used Garbage Trucks For Sale! Our used garbage trucks are fully reconditioned and ready to roll. Browse our big inventory of trash trucks, dump trucks, rear loader and front loader trucks, grapple and roll off trucks and more – all in great condition and set to go to work! Browse our Inventory Page! 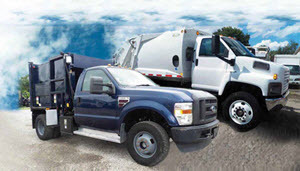 Then call us with questions about any used waste management truck you see – or come by and have a look! You’ll find a BIG VARIETY of makes and models, between 2 years to 10 years old. Most of our reconditioned garbage trucks are between 4 and 6 years old and in great condition. We have an extremely thorough checklist of more than 200 items that every truck receives before we offer it for sale. We not only fix what’s wrong, we look for anything that COULD go wrong and take care of that, too. See our Truck Reconditioning page. Our prices are competitive and our work is second to none. Top mechanics averaging 25 years of experience go over our used trucks with a fine-tooth comb. Parris Trucks Fact: We pick up our customers at the airport, and drop them off, if needed! For new inventory updates and industry news join our mailing list!